Damn those top 3. So epic. Anyone have the Roy Bot final? The judge Judy one is a masterpiece compared to the other 2 "now" crap. It's owned and I've seen it. It's beautiful. I don't think it's ever been publicly announced so I won't reveal that info. Let's just say the identity of the owner wouldn't come as a surprise. It's like the difference between Michael Angelo's 'The Creation of Adam' and Mrs. Anderson's Kindergarten finger painting contest. Junghwa Im. My four year old daughter paints better Gpk than her. She is single handedly ruining this hobby for me. Her work is diluting the product. The bottom row cards aren't even the worst you can expect to get these days. Modern sales keep the popularity of the Original Series going for future generations. 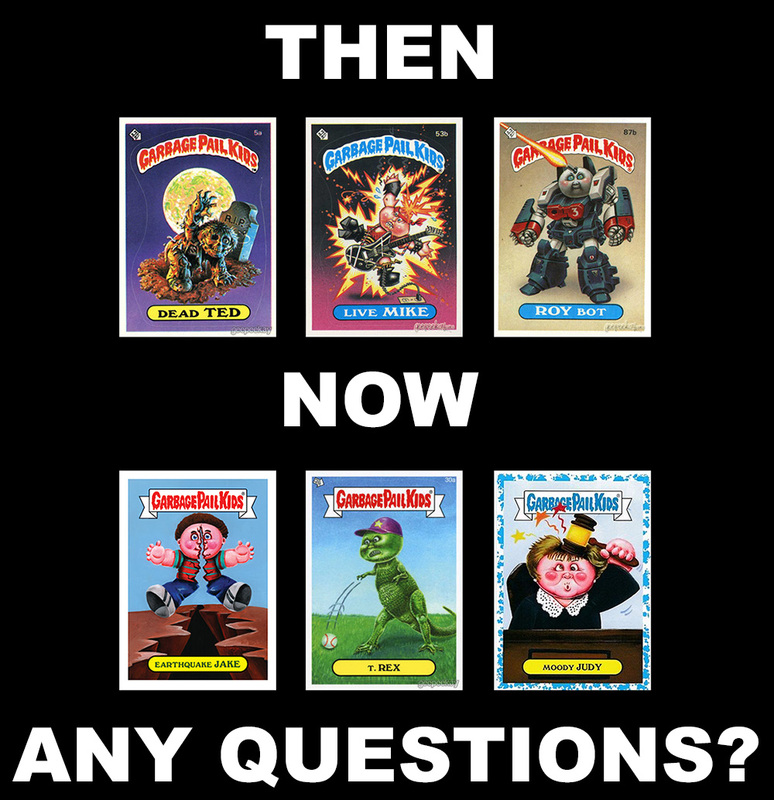 Without new product, GPK begins to lose popularity with newer collectors, leaving it only to the ones that remember collecting GPK back in the day. IDK why peeps hate the new stuff so much. Really the OS cards are so-so as much as any of the new cards. lol say what? Run that by us again please! To be fair. OS10-16 really didn't bring the highest quality stuff. The more I look back, 0S 1-9 was pretty much on point. The brand did suffer with the restraints of the lawsuit. I do think that if we were still kids, this new artwork wouldn't seem as bad. But we are all fully aware that the online releases and two newest retail releases are crap. They should have stuck with the BNS line and continued it. All of these themed sets and contained art are sub par. I actually am just going back to collecting OS 1-5 stuff and maybe get into some foreign sets. Until Topps gets someone who actually knows GPK, they will be targeting the part time fans, who are too dumbed down to realize what they are buying. Think legacy. Without the new stuff, there would be no more original stuff, except for the small niche of collectors that were kids from 1985-1988. New GPK is very important to maintaining the legacy of the brand. It reasserts the value of the Original Series, and brings new collectors to appreciate it. For that small niche of original collectors like me, OS is already perfect in it's current state and can never be replaced, but if it was repackaged and released today, kids may not feel the same way. Remember, Topps stopped reprinting Chrome because it didn't bring in the dough except from probably original collectors that saw the value in it. OS was perfect for the time period that it was released, and continues to remain timeless through the reassertion of new GPK releases. How many card sets from the past remain as popular as GPK today without any new product. For these reasons, I think the new stuff is great. To be fair to who? Jungwa Im? There's no debate about whether OS has crap cards or not, we're talking overall quality. OS1 - OS9 is included in that OS run so you can't exclude that. My point is comparing this new trash with a run of series that includes Jay Decay, Mad Max, Jolly Roger, etc. would be craziness, if not sarcasm. OS art was rushed. Look at it. You can see all the little brush strokes. I much prefer the polished look of the new art and really like the digital art the best. And the online. everyday sets? Keep them coming! Topps with a moment of brilliance cashing in and the art is superb with awesome gags to match. Remember, Topps stopped reprinting Chrome because it didn't bring in the dough except from probably original collectors that saw the value in it.. I think it is a combination of sorry concepts combined with in general low quality artwork. Good concepts with so so art would still be engaging. My question is why are the gags so bad? I just think it's a different generation of people in control. I also believe they don't have good judgment, taste or any clue what the brand is about . For the first time ever, in 32 years, I only purchased a few packs of the new release and still felt regret . Chrome 3 would be the only redemption, as that's when most OS collectors really started. Topps doesn't care anymore obviously and people keep buying the online trash and themed releases . I keep hoping they will bounce back, but change is hard for some people. Can we ban this guy, haha! Huh? Hey look, it's Turn-on Ron #352b. Dressy Jesse went that way ---> Go get you some of that classic.